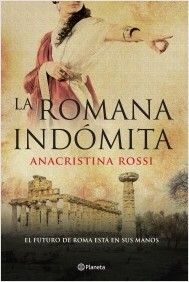 [es] In her new historical novel, La Romana Indómita, Costa Rican writer Anacristina Rossi leaves behind her familiar Central American territory and ventures across the sea to ancient Rome. She takes as her protagonist the daughter of Emperor Augustus ­– Julia, another in Rossi’s line of strong heroines. As a conspiracy takes shape against the emperor who had turned a republic into an autocracy, Julia finds herself caught between sympathy for the conspirators’ goals, allegiance to her sons (designated Augustus’s political heirs), and her love for Augustus. To supplement her research, she drew heavily on her own imagination for Julia’s story, which Rossi presents, almost movie-like, as a series of scenes. She told a writer for the Buenos Aires newspaper Crónica, “There was so little information about her, that really the reconstruction comes more from inside me than what history could say.” Julia is so unknown,” she told Víctor García Esquivel, “that there are few facts about her, for the most part she is accused of being a prostitute and a bad woman,” but that image, Rossi believes, derives from Julia’s father’s effort to destroy her reputation because she opposed the tyranny of his rule. La romana indómita, published in Mexico by Planeta, is available as an e-book from the publisher and from online bookstores, including Amazon.